It's hard for me to believe that mohair could ever produce a supple, soft fabric because my first impression was formed by a pale pink shawl given to me when I was ten or twelve, to be worn over a bare neck with a dress for special occasions. I T C H C E N T R A L.
But actually - when organic, and spun with organic wool, and dyed thoughtfully by Sylvia at Stoddart Family Farm? Omigosh. So lovely. 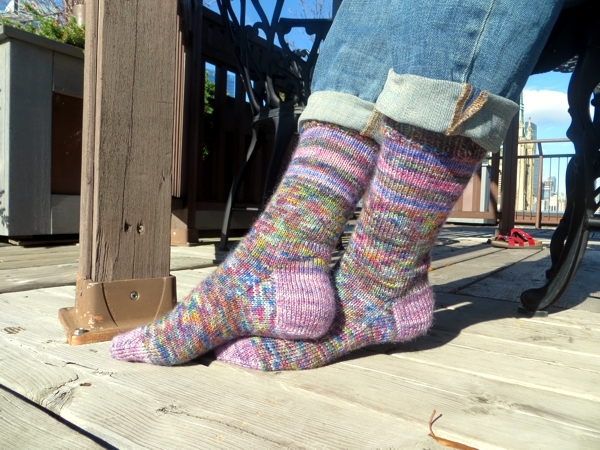 These are obviously purple socks. I mean, the heels and toes are purple, and so are the stripes, and there are purple flecks all over the rest of them, but I think of them as blue anyway. They are just that perfect with jeans. It's so important to have warm feet, don't you think? When your toes are cold, the world is a darker, less friendly place. But when they feel protected and nurtured you can stand up to anything. You can blossom. I feel pretty sure that this is the first time I've had to take pictures of finished objects at the condo instead of on my shabby old porch or in my garden. 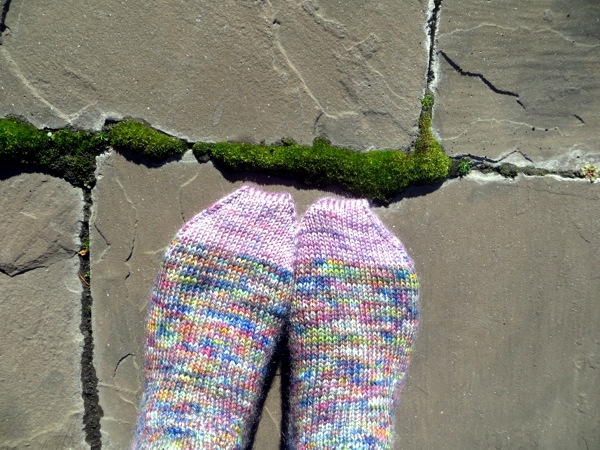 Finding some moss on the top floor terrace made me miss the moss between our flagstones. I don't even know whether our moss will survive under a year's worth of dead leaves and sun deprivation, but I guess we'll find out. I guess too, our garden will be shady again, sheltered under a second storey. It got brighter last year, the sole upside of losing part of our beautiful old maple tree. 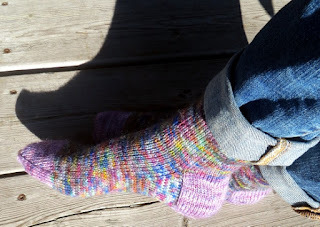 But I can pretty much guarantee I will still be loving these socks when we get back into the house, and that if I have to replant a lot of what we had, I will be keeping them safely out of my gardening clogs. Because MAN that is going to be a messy job! 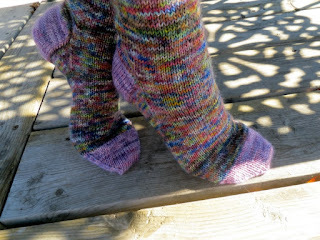 Those are lovely socks, and I can see why you think of them as blue, blue is the predominant colour in the main yarn. I would never have thought that mohair would woek for socks though, but these prove me wrong! 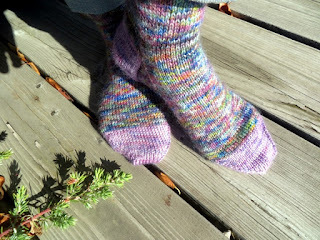 The mohair/romney wool blend is my FAVE for winter socks Su - not just soft and hardwearing, but super warm! !